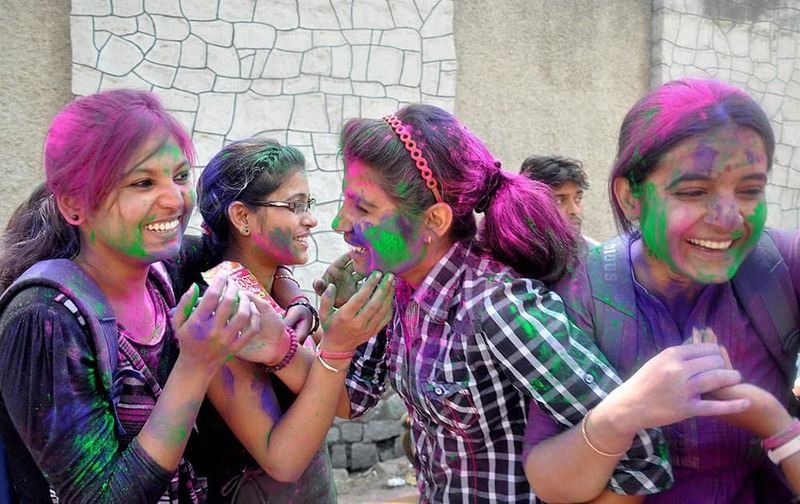 College students playing with colours ahead of Holi festival in Ranchi. 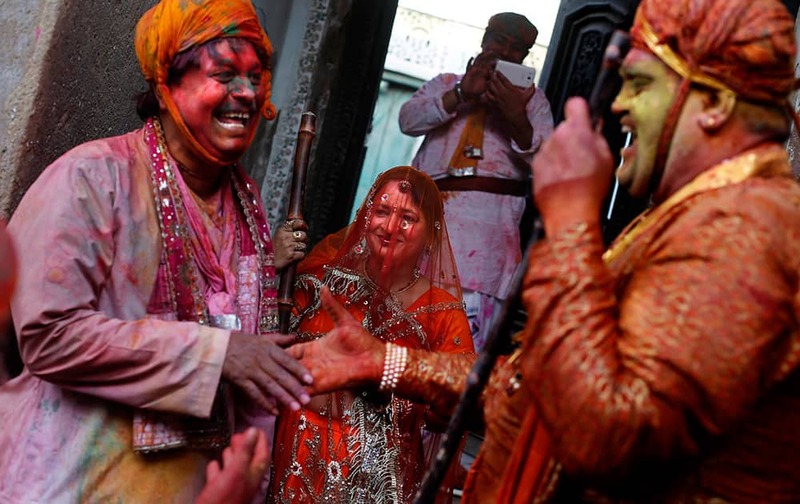 Foreign tourists celebrate Holi in Jodhpur. 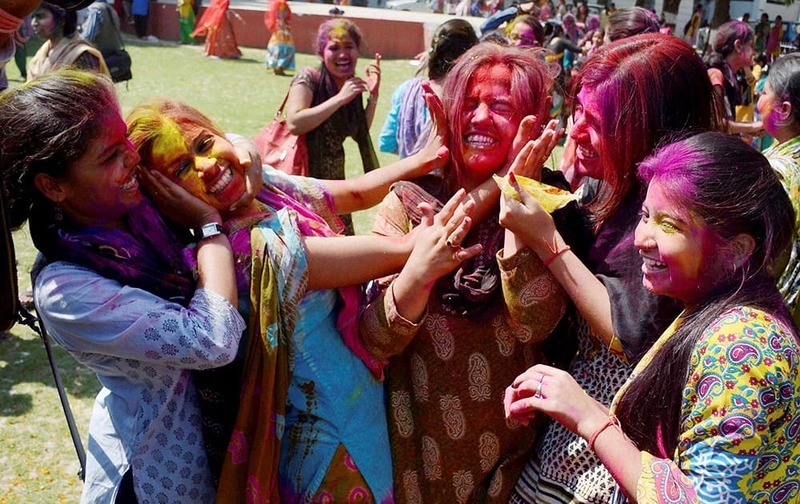 Collage student celebrating holi in Lucknow. 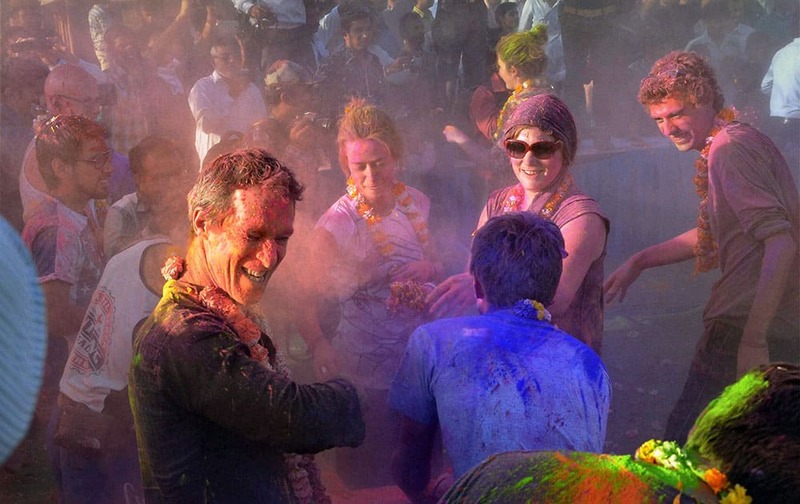 Foreign tourists during a Holi celebration in Jaipur. 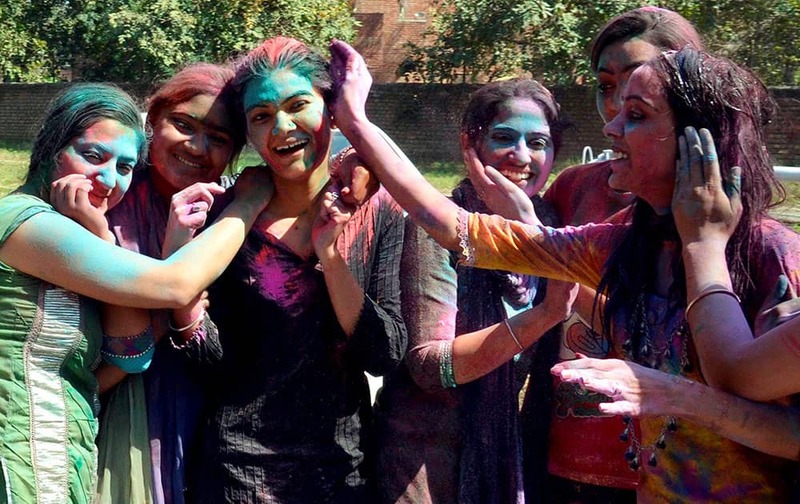 College girls celebrate Holi, the festival of colors in Guwahati. 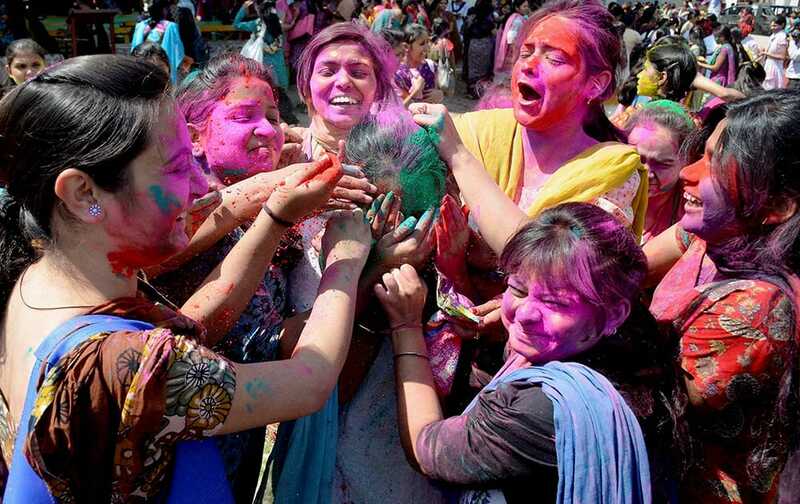 University students playing Holi in Amritsar. 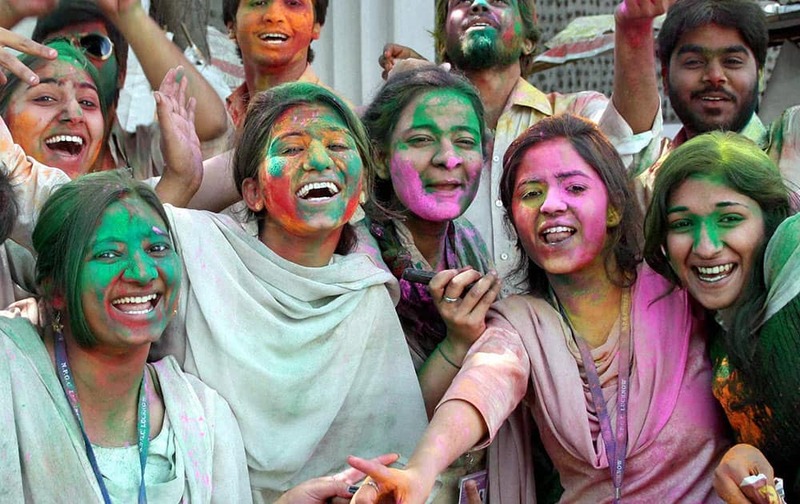 Blind girls playing Holi at a school in Mumbai. 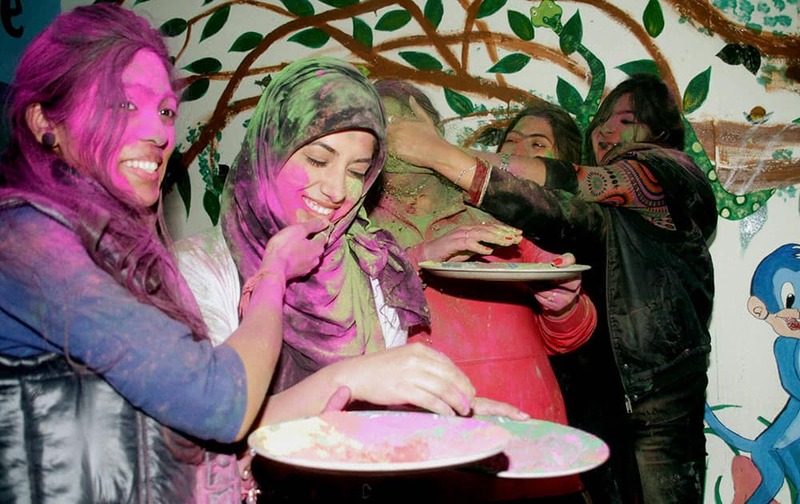 College girls celebrate Holi, the festival of colors in Jammu. 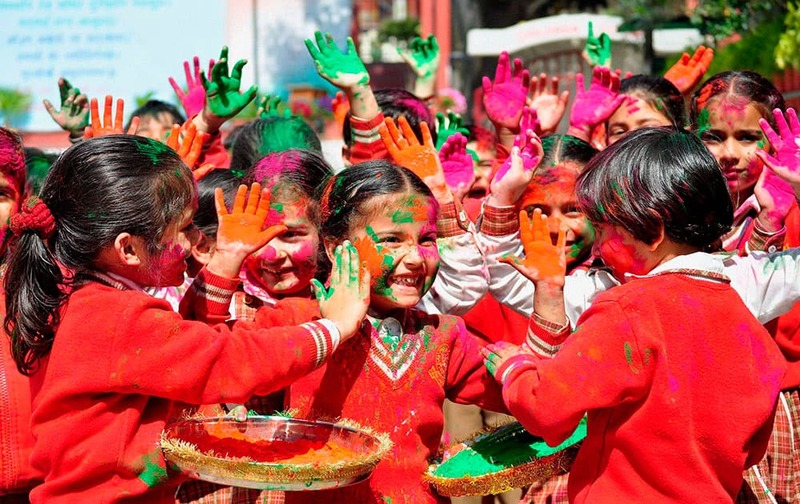 School children celebrating Holi in Patiala. 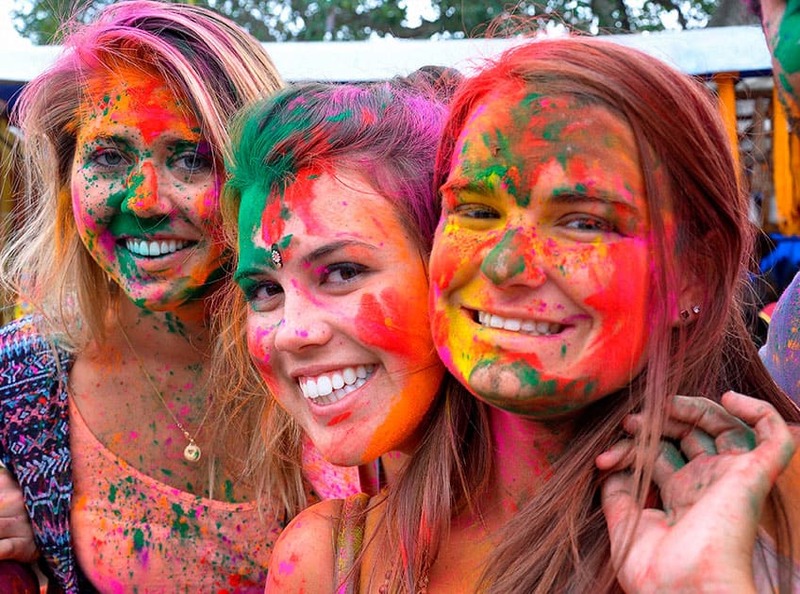 College students playing with colours ahead of Holi festival in Agartala. 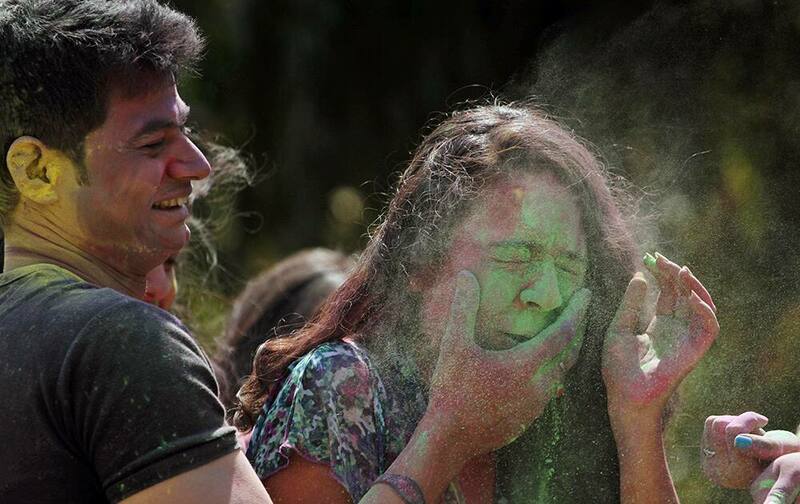 A man smears color on the face of a girl as they celebrate the Holi festival in Ahmadabad. 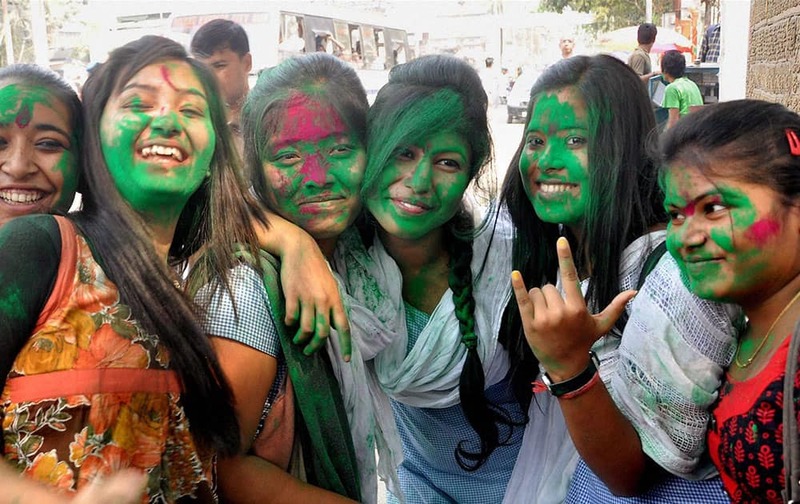 Students of Patna Women's College playing Holi in Patna. 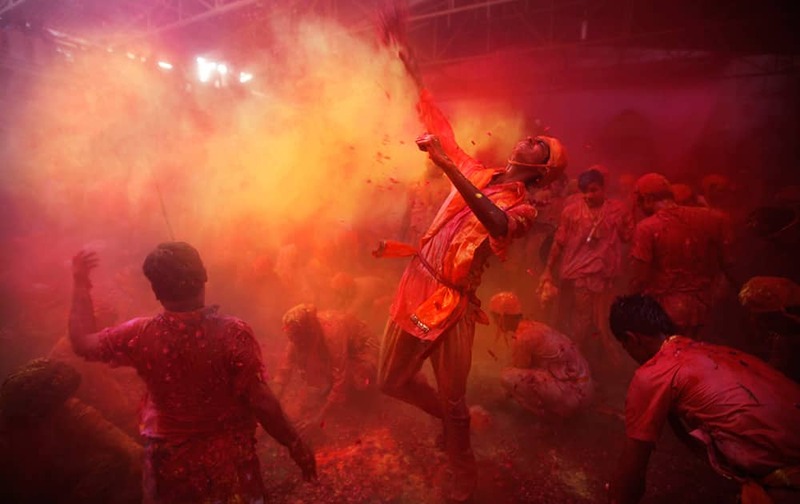 Hindu men from the village of Nandgaon throw colored powder on others as they play holi at the Ladali or Radha temple before the procession for the Lathmar Holi festival, the legendary hometown of Radha, consort of Hindu God Krishna, in Barsana. 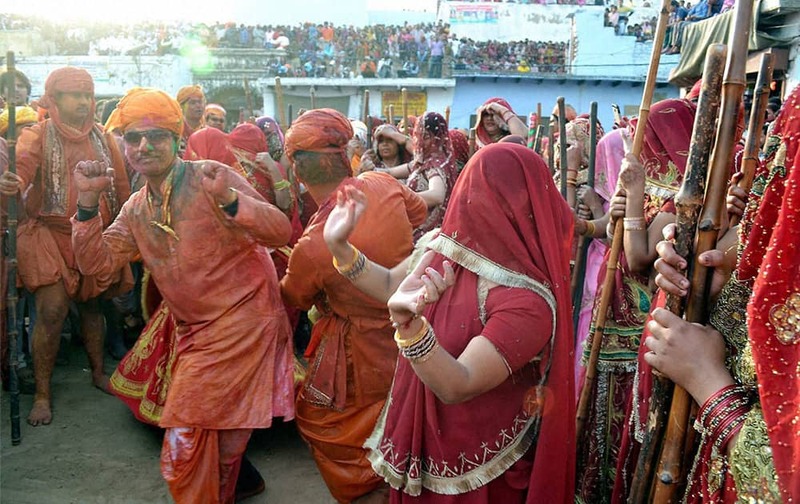 A man from Nandgaon village greets a villager from Barsana as a woman from village Nandgaon waits with a wooden stick during the Lathmar Holy festival in the legendary hometown of Lord Krishna in Nandgaon. 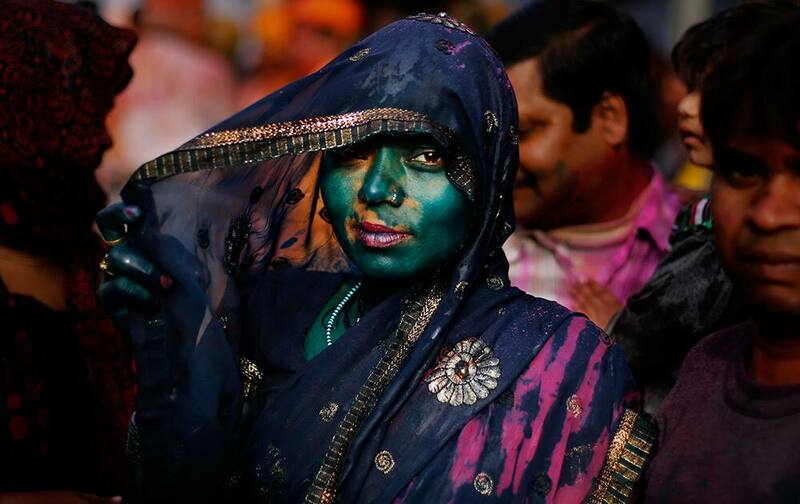 A Hindu woman, drenched in colored water, looks on at the Nandagram Temple famous for Lord Krishna during Lathmar Holi festival in Nandgaon. 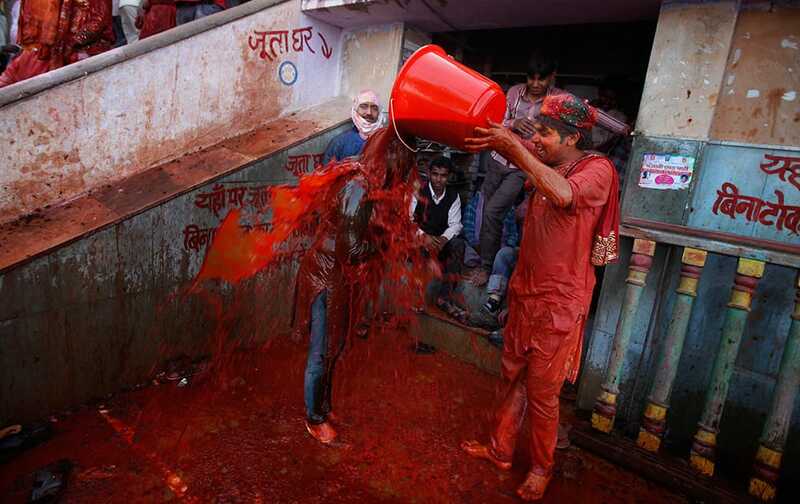 A Hindu man pours a bucket of colored water on a woman outside the Ladali or Radha temple before the procession for the Lathmar Holi festival, the legendary hometown of Radha, consort of Hindu God Krishna, in Barsana. 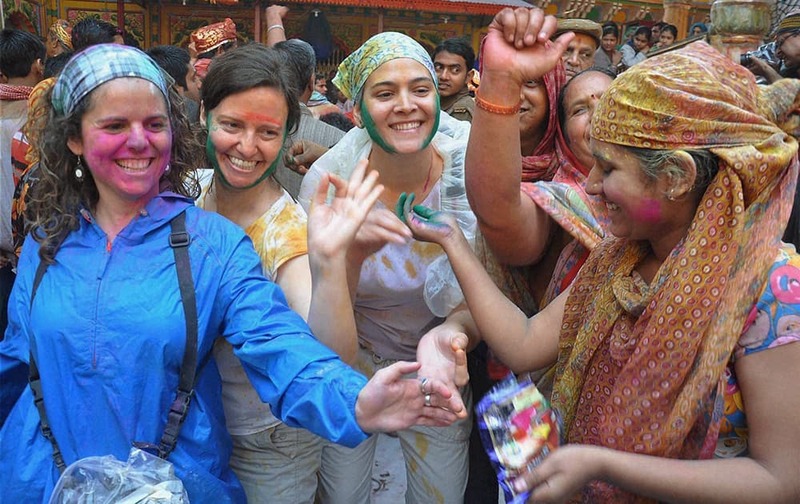 Foreigners take part in Holi celebrations at Dwarkadheesh temple in Mathura. 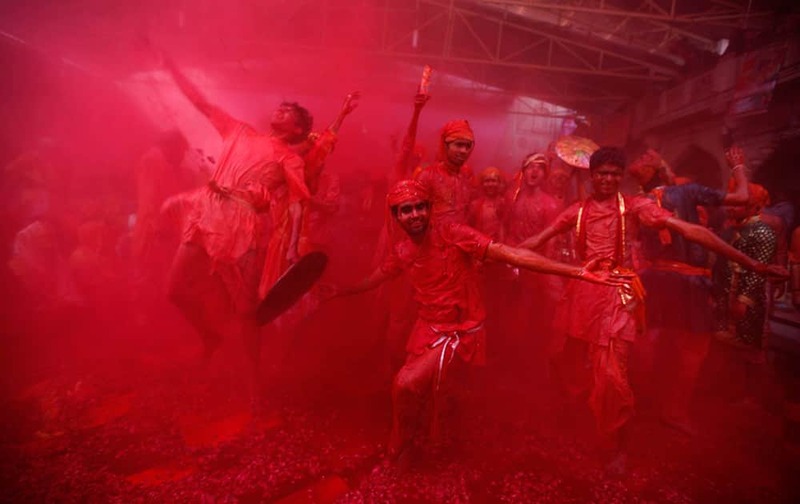 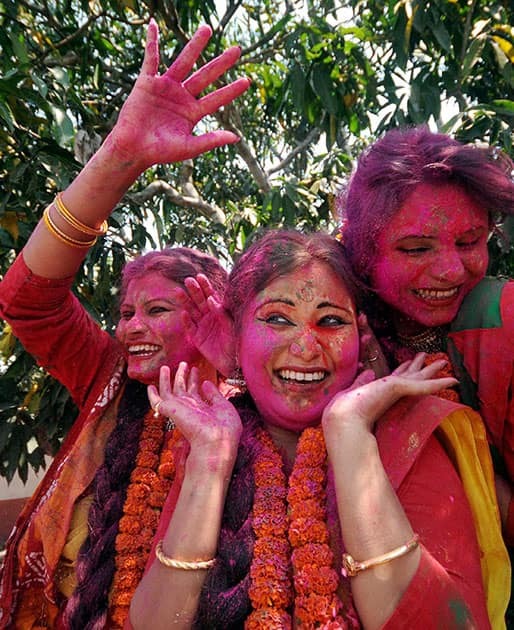 Devotees celebrate Holi at Raman Reti in Mathura. 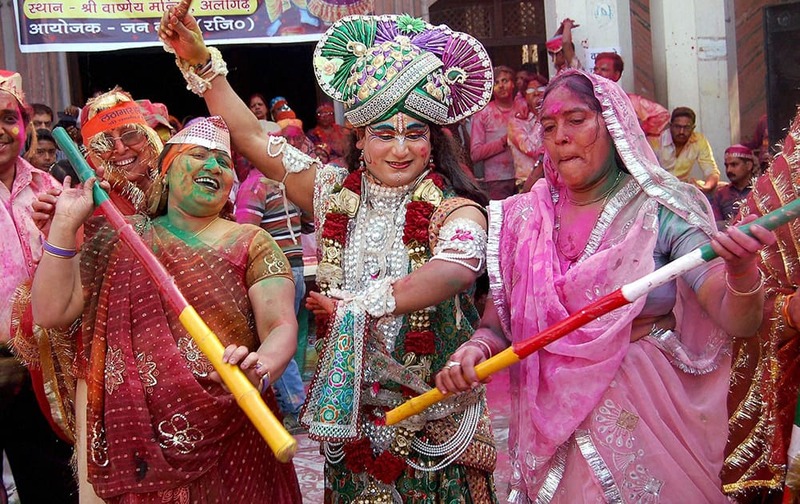 A Hindu devotee dressed up as Lord Krishna along with other devotees during a Holi celebration in Aligarh. 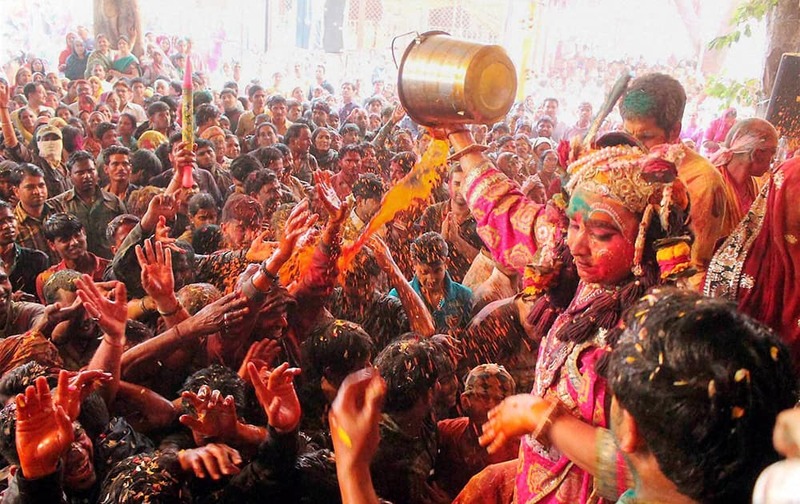 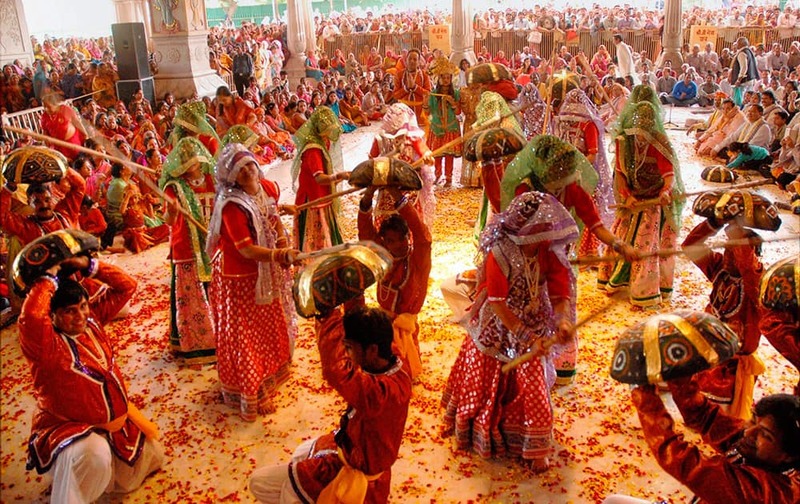 Men and Women playing Holi in Mathura. 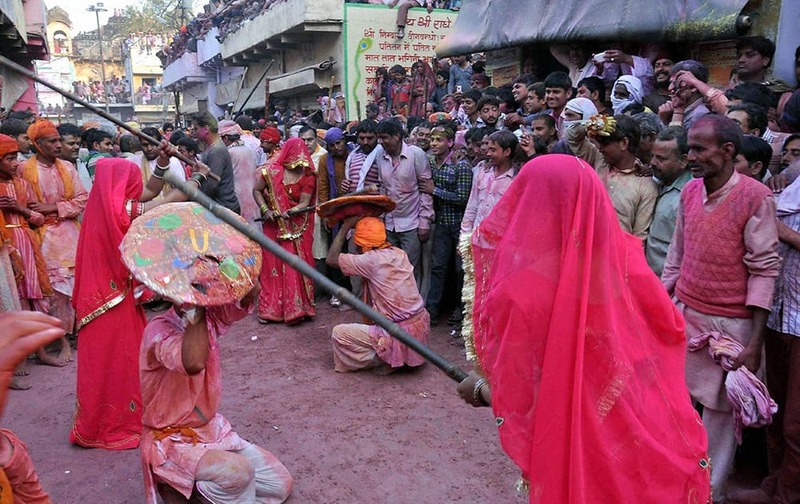 Barsana women beating up men of Nandgaon with sticks during Latthmaar Holi celebration in Mathura. 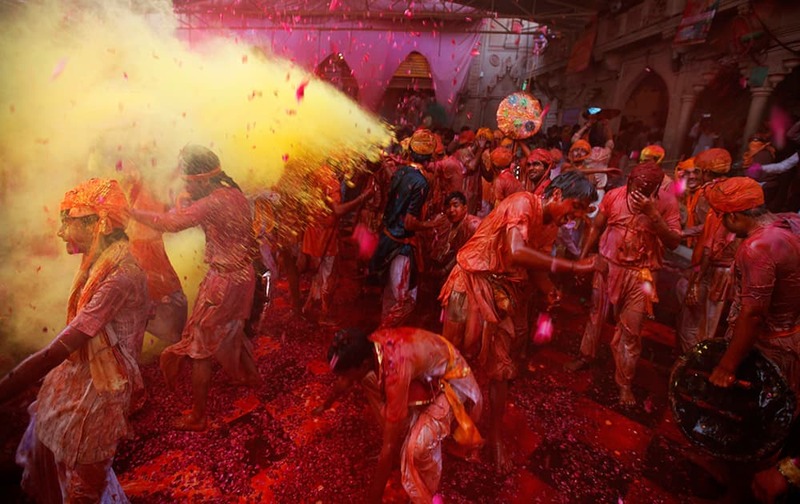 Men from the village of Nandgaon throw colored powder on others as they play holi at the Ladali or Radha temple, before the procession for the Lathmar Holi festival, the legendary hometown of Radha, consort of Hindu God Krishna, in Barsana. 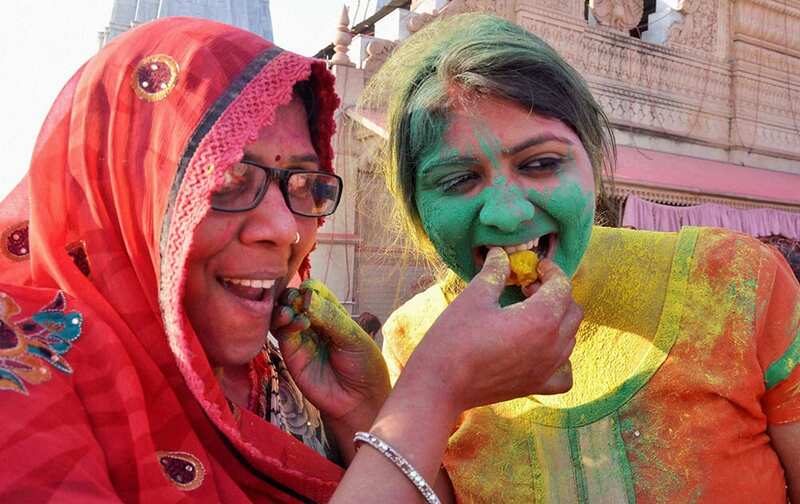 Women enjoying ladoo during Latthmaar holi celebration in Barsana near Mathura.